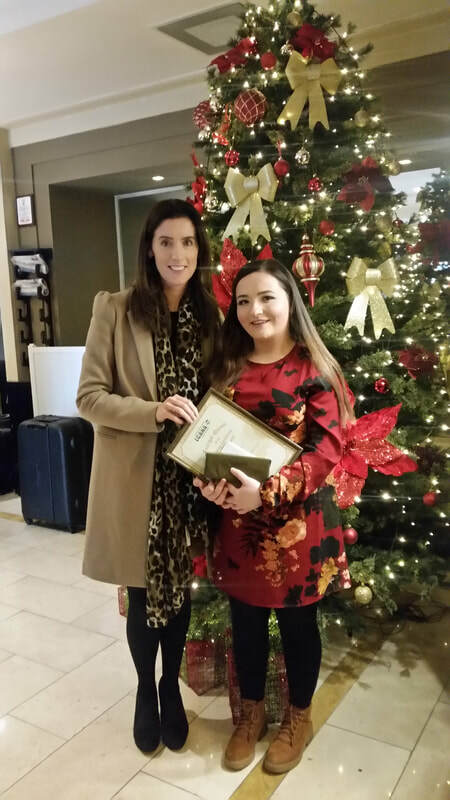 On the 24th November, Leah Boyle, L.C.A class of 2018, received the very prestigious National Fergal Quinn Award for achieving the highest number of credits in the Leaving Certificate Applied 2018. The delightful ceremony took place at a special lunch in the Shamrock Lodge Hotel, Athlone on Saturday November 24th 2018. The lunch was attended by Leahs family members, Ms. Bernie Hanna (LCA coordinator), Dr. Harry Barry (Keynote speaker), Minister Kevin Moran and Ms. Louise O Reilly, Education officer with the NCCA. The awards were presented by Minister Kevin Moran who was full of praise for the recipients. He praised their dedication and commitment to their studies and wished the students every success in the different courses they had chosen after their Leaving Certificate Applied. Each school was presented with a framed certificate commemorating the success of their individual students. The students were also presented with a framed certificate, a specially engraved Newbridge silver pen and a voucher. St. Aidan’s Comprehensive school is extremely proud of the extraordinary achievement of Leah Boyle in securing such excellent results in the Leaving Certificate Applied programme. As a Leaving Certificate Applied student, Leah was a very enthusiastic and hard-working student who always produced her work on time and to a very high standard. Leah’s pleasant manner, her warm heartedness and her positive outlook ensured that she played a key role in her Leaving Certificate Applied group and indeed to the whole school community. She was a diligent and conscientious student, who worked meticulously throughout the Leaving Certificate Applied Programme and she truly deserved this award. Her excellent exam results are a worthy testament to her years in St. Aidans and to the team of dedicated and hardworking teachers. Leah is presently doing her QQI Level 5 Certificate in Beauty Therapy in Cavan Institute and is enjoying the course immensely.